If you have never heard ofOLAPLEXyou need to get this liquid gold/magic potion in your life asap! It’s been around for a while now and I have heard so many amazing things about how it transforms coloured hair. I have never opted for it in the salon because I have survived without it so far, but these days, any good hair colourist will use it in their hair dye mix to protect your hair from damage while it is being dyed. It costs from around £20 so it’s definitely worth it. My hair is really blonde and in okay condition as I treat it with masks every week and also use several oils as I dry it, while wet and then dry so I do look after it. OLAPLEX on the other hand is some sort of next level treatment. I cant believe I have only started using it after 10 years of being a blonde, especially since my hair is naturally dark brown and nearly black! OLAPLEX contains a patented active ingredient that works on a molecular level to seek out broken bonds in the hair that are caused by chemical, thermal, and mechanical damage so even those of you who don’t colour your hair can use it. See below, it’s disgusting right? 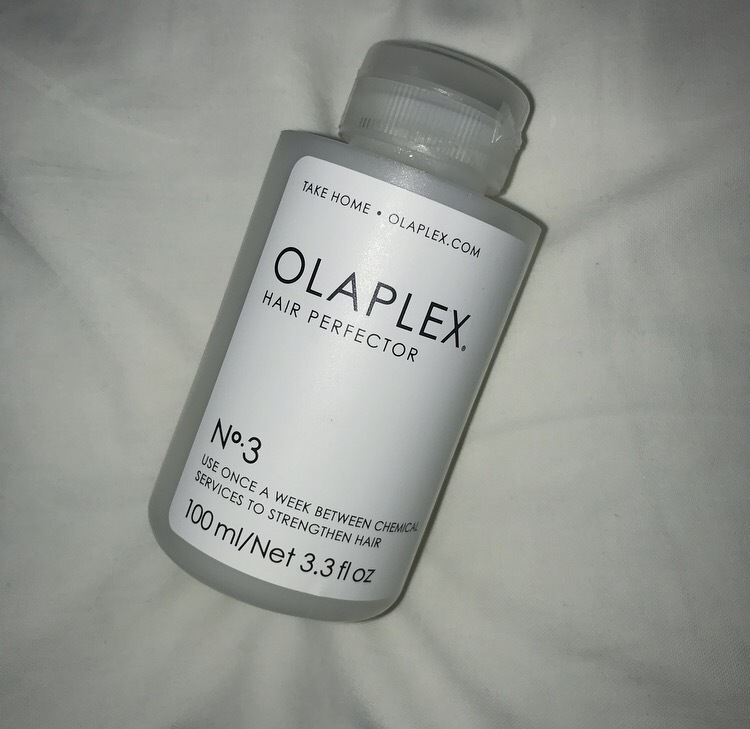 I have been trying out the No.3 at home bond builder that contains the same active ingredient found in all of the professional OLAPLEX products. The patented technology relinks the broken disulfide bonds in every type of hair providing real, structural repair that works from within. It dynamically repairs damage to all hair types, and it can also be applied once a week between chemical services to further lock-in the results of any salon treatment. Its super easy to use, all you do is apply a generous amount to wet, towel dried hair. Comb it through and then leave for 10 minutes or longer if you wish to get a more intense treatment and 30-90 mins is ideal. To finish, wash out and then shampoo and condition as normal. The results are amazing. I was quite surprised at first, because when I combed through my hair it didn’t feel really creamy and soft like it normally does after a hair mask. Once I dried it I realised that my hair in fact was repaired from the inside, and looked and felt stronger. It’s not a conditioner, so it won’t give you that soft feeling which let’s be honest, only every lasts one wash as the conditioner only sits on the surface of the hair. OLAPLEX on the other hand makes the hair bonds stronger and it’s immediately noticeable. If you want that super shiny and smooth effect, you can use it with a hair mask. Repeat once a week. I have been using mine for 3 weeks now and absolutely love it! It really does spin straw to silk, it’s probably one of my favourite and most needed beauty product. My hair is stronger, healthier, softer and looks super shiny.